Which among the following causes failure of closure of posterior neuropore? 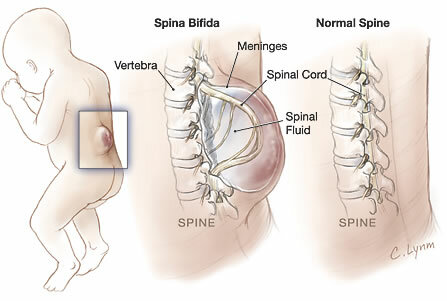 Spina bifida is a complex birth defect affecting the spinal cord and central nervous system. Lack of maternal folic acid is identified as a causative factor in an estimated 50–70% of cases. Mechanism of formation: The more severe forms of spina bifida are the result of failure of closure of the posterior neuropore. Less severe forms, such as spina bifida occulta, are the result of failure of secondary neurulation and failure of tail bud formation.